Dance Commentary by Heather Desaulniers: "1776"
American Conservatory Theater has kicked off its 2013-2014 season with an absolute winner, “1776”. A combination of superb direction (by Frank Galati), inspired choreography (by Peter Amster), impeccable musical direction (by Michael Rice) and an especially talented cast makes this show a must-see. Within its character- and event-driven narrative, “1776” is able to carefully balance the pithy, clever and the humorous alongside an undercurrent of deep integrity, burning passion and true humanity. 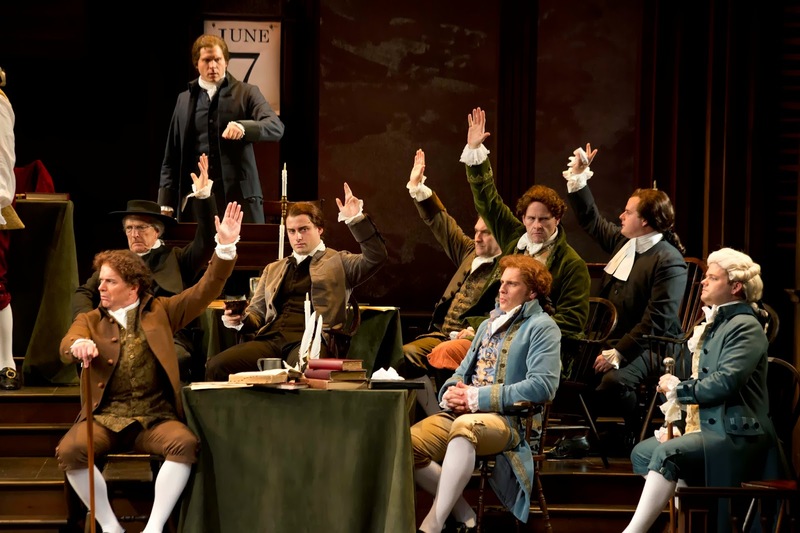 From the first group musical number where approximately twenty male voices blended in multi-part harmony to the moment the final scrim fell, “1776” was theatrical perfection. There is only one downside - “1776” only has two more weeks left at The Geary Theater in San Francisco. A dramatization of historic events, the story unfolds during a crucial two-month period in mid-1776. The audience witnesses as Independence is debated in Congress, the Declaration of Independence is drafted, and finally, the document is agreed upon and signed. As one might expect, dance does not figure too heavily in the two hour, thirty minute production - a tap extravaganza in the middle of a political chronology could be a bit much. But throughout “1776”, when movement was called for, Peter Amster’s choreographic choices could not have been better. All of the dances were very personalized – reflecting both the idiosyncrasies of each character, as well as the interactions between them. Act I’s “The Lees of Old Virginia” joined resolute marching steps with forward moving step-ball-changes and whimsical pas de basques. “But Mr. Adams-” had a similar duality. What began as a very proper, courtly dance with carefully placed step-touches ended with a hilarious kick line. “He Plays the Violin”, Martha Jefferson’s (played by Andrea Prestinario) pas de trois with John Adams and Benjamin Franklin (portrayed by John Hickok and Andrew Boyer, respectively) was delightfully fun. Amster proved with this particular dance that he could choreograph a complete partnered waltz sequence (which the performers also danced full-out) with very little space. Though Act II had less choreography than “1776’s” first half, “Cool, Cool Considerate Men” was by far a noteworthy moment. Jeff Parker as John Dickinson led the rest of the conservative characters through a staid, resolute and stalwart suite of Baroque period dances. Dances from this era, such as the Gavotte and the Minuet, had set choreography – never straying, never surprising. You could count on them to stay the course and stay the same, which was also the message that these characters were attempting to convey in that moment in time.